Creminos Bicolore are a hazelnut & cocoa praline, these delicious chocolate bars are sure to satisfy your sweet tooth. Ingredients: sugar, palm vegetable fat, cocoa powder, nonfat milk, maltodextrin, hazelnuts, soy lecithin, vanillin and artificial flavor. 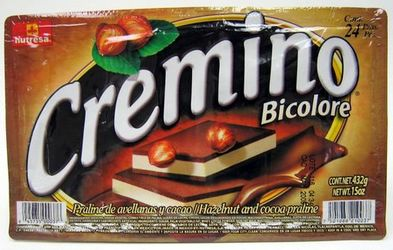 Los Creminos Bicolore de Nutresa son una suculenta combinacion de avellanas y cacao. Estas deliciosas barras de chocolate satisfacen tu antojo! Ingredientes: az�car, grasa vegetal comestible de palma, suero de leche, cocoa, leche descremada en polvo, maltodextrina, avellanas, 0.25% de lecitina de soya, vainillina y saborizante artificial. I order this chocolate for a friend and he shared them with me and I was pleased to say they are really good!! Very tasty and the shipping and handling was timely and professional! Loved overall experience! I fell in love with this candy in PV, Mexico. Mexgrocer provides this candy at a reasonable price and it is delicious I just wish they would get it in WHITE CHOCOLATE also, I saw it in white at another web site. This product is so good I will order it again . ProsEverything. The chocolate is mild and the hazelnut filling is wonderful. These are the best hazelnut and cocoa praline chocolates I have ever had. They are very addicting!